Hunt: Showdown brings some PvE elements to the battle royale formula and you'll be able to try it in the near future. The landscape for competitive survival games is thick with opportunity. 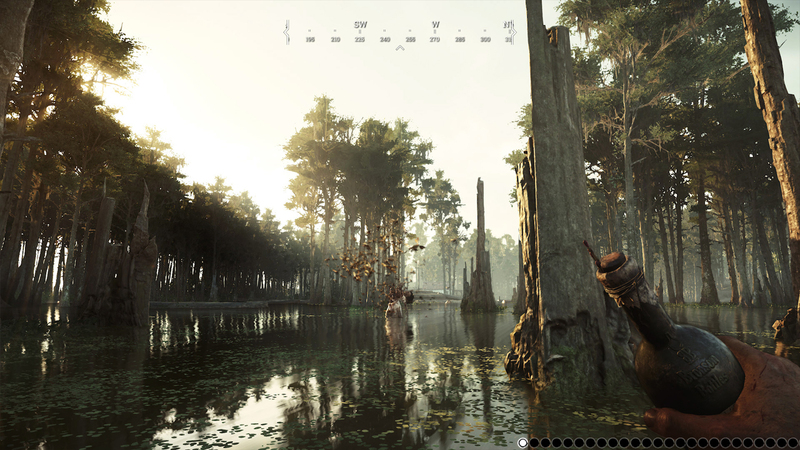 Crytek is gearing up to share one of the most intriguing entries in the genre with the world, as the developer announced today that an Early Access release for Hunt: Showdown is on the way. Earlier in the year, Crytek revealed that their multiplayer shooter Hunt: Horrors of the Gilded Age was undergoing a bit of a change. The name was changed to Hunt: Showdown and, at E3, the press was given a peek behind closed doors at just what was in store. To someone with no background on Hunt, the trailer starts off like a dark co-op FPS that takes you into the depths of a swamp region riddled with the stars of our worst nightmares. This is only the tip of the iceberg, though. Hunt: Showdown blends horror, survival, stealth, monster hunting, and battle royale elements together into a crazy intense competitive experience. You and a partner are dropped into a large map with the goal to hunt a monstrous target. There are smaller dangerous creatures on the map as well, but you must defeat or avoid them as you collect clues that lead you to your main objective. Your team isn't the only one on the hunt, though. Matches consist of up to five teams of two and, beyond potentially encountering these other hunters as you peruse the map, you'll draw the attention of all surviving teams once you acquire your bounty. After killing the target, it must be banished in order for you to collect your reward and this will give away your position. The final wave begins then and you must survive the monsters in your vicinity that are attracted and the hunters that come for your bounty. “We believe strongly that community-driven development is crucial to creating a great online multiplayer experience," says Hunt Producer Fatih Özbayram in a press release for the announcement. "An Early Access release will allow us to get Hunt out to players as quickly as possible, to collect feedback, and to work closely with the community to continue to shape the direction of the game." PvP experiences with such an incredible amount of things going on in a match definitely need testing on the scale allowed by Early Access and the Crytek team will also be adding more game modes, map variations, traits, crafting elements, monsters, and more throughout the life of EA. Ultimately, it will be interesting to see how Hunt impacts a gaming landscape very hypnotized by the battle royale formula. No launch date for Early Access has been given but the Steam page is live. Cool looks good, I wonder how it will do against PUBG. I dig the Resident Evil type / Horror vibe.